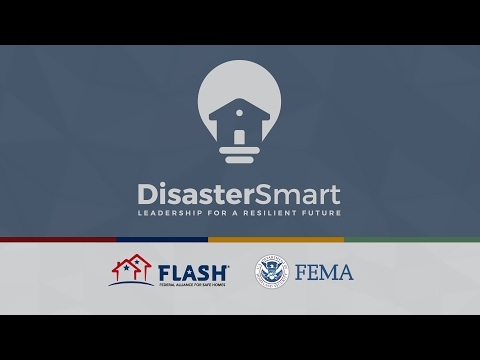 FLASH, FEMA Launch DisasterSmart – Leadership for a Resilient Future. In honor of Building Safety Month, the nonprofit Federal Alliance for Safe Homes (FLASH) and Federal Emergency Management Agency (FEMA) today announced DisasterSmart – Leadership for a Resilient Future, an initiative designed for leaders seeking to enhance community resilience before and after natural disasters. The initiative provides commentary, video, and a resource library that outline the cost-benefits of smart building code practices, including life safety, insurance savings and heightened pre- and post-disaster relief eligibility. DisasterSmart comes in the wake of accelerating human and economic disaster losses across the United States as well as mounting economic evidence that validates building codes and beyond-code construction practices as essential to increase public safety, shorten recovery time, and reduce the economic impacts of natural disasters. In addition to building code case studies, the effort highlights resilience policy fundamentals; incentive-aligned relief programs; public-private partnerships; and smart disaster finance. The resources support a leadership path to increased public safety, more disaster-resistant structures, and preservation of a community’s workforce after a disaster. Lessons learned from natural disasters demonstrate that having proactive policies in place before earthquakes, floods, hurricanes, tornadoes, wildfires, and other natural disasters strike help to save lives, decrease financial losses, and ensure that communities bounce back swiftly following an event. Action ahead of a disaster can mitigate secondary impacts such as fires, power outages, transportation interruptions, and water contamination as well. To learn more and view a video about the DisasterSmart Leadership Program visit the DisasterSmart website or email info@flash.org.